I'm packing up the van and heading off to our Newfoundland National Specialty with Spencer and Truman. I will be away April 28th thru May 5th however you can still order from the website. All special orders placed that week will be delayed one week. All In Stock bib orders will be shipped out the following week in the order that I receive them. Thank you for your patience. Special orders for my bibs have increased enough that I need to extend the time to complete them. Please allow up to 4 weeks to receive your special order. Although my workload has increased, my standards for quality will not decrease. I will continue to take the time on each order to ensure a quality bib for each customer. Thank you for your patience. If you have any doubts as to which size to choose for a bib, please measure your XXL companion's neck circumference and front of chest width and height and compare them with the bib measurements described on the Drool Bib Sizing Description and Care page. We want you to be happy with your purchase! 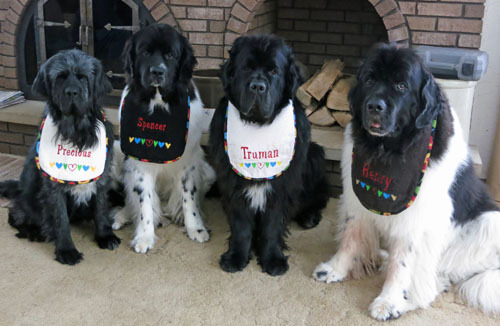 Pictured below is my gang of newfies wearing all three different sizes of bibs. From left to right is Precious, our 90 lb foster girl wearing a puppy sized bib. This size is perfect for the smaller sized XXL dogs. Pictured next is Spencer, the youngest of my crew and not fully developed. Even though he is the tallest of my gang, a medium size seems to work the best for him as he doesn't have a real heavy bone structure. His head is not huge and he doesn't have a big neck. The next two are Truman and Henry. They are wearing the large size. They are fully grown newfies with good size heads and necks. If you experience any problems with the my website, please contact me. I would like to hear about it.